The growing healthcare expenditure provides significant opportunities to hospitals and companies in generating higher revenues. According to the Organization for Economic Cooperation and Development (OECD), the spending on healthcare is estimated to reach US$ 10 trillion by 2020. The healthcare spending in most of the European countries is growing faster than their GDP. According to the U.S. government’s center for Medicare and Medicaid Services (CMS) the healthcare expenditure has risen approximately by 7% and is expected to cross US$ 2 trillion. The Congressional Budget Office states that if the growth in healthcare spending continues at this rate, the CMS spending and private health cost would increase approximately to 25% of the GDP. For minimizing the healthcare costs and improve the quality of life, countries across the world are seeking to shift the place of care from healthcare facilities to wherever the patients happen to be during their normal day. Half of all the healthcare will take place outside the healthcare facilities within the decade. In many cases, the future of healthcare will be environments such as the home, workplace, school, café, or gym, with the patients responsible for the administration of their therapy. With the typical frequency for a self-injectable biologic ranging from one week to every month or quarter, devices that contain and deliver a drug must be highly intuitive. This trend will continue to accelerate over the next decade, as payers and providers will seek greater access to real-time, cloud-based data that can accurately assess how patients with a chronic disease adhere to their assigned drug regime. Health service providers increasingly collaborating with customers are expected to demonstrate clinical and financial benefit of services and the penetration of artificial intelligence technologies and big data analytics in health technologies, especially for real-time decision making to manage chronic diseases will pave way for future prospects for the market in North America in the near future. Vendors achieving economies of scale by leveraging large customer base and maintaining leading market position are expected to take the market forward in the long run. High geriatric population in the U.S. is anticipated to boost the demand for home healthcare and patient monitoring devices and services in the region and thus, augur well for the market growth in the region. 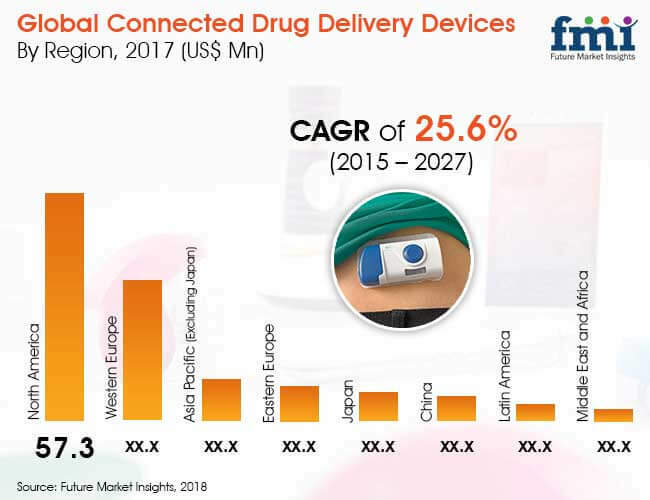 Countries such as France, Germany, Italy, and Spain are expected to witness fluctuating demand for connected drug delivery devices in the coming years. France has high potential market but adoption of mobile health is average showing more reluctant to embrace digitalization of healthcare. The implementation of mobile health and related connected drug delivery devices is expected to present considerable challenges, including technological barriers, organizational challenges, confidentiality concerns and unplanned aftereffects. German consumers’ willingness to invest in their well-being and fast data networks is providing fertile ground for mHealth and connected drug delivery devices market growth. Health insurers in Germany have not yet introduced comprehensive reimbursement for m-health applications and connected drug delivery devices, any such strategic changes to acquire larger set of customer will be focused on younger, healthy consumers willing to pay for these services. This might adversely impact the market growth in the region. FMI utilizes a triangulation methodology that is primarily based on experimental techniques such as patient-level data, number of procedures and capital equipment install base to obtain precise market estimations and insights on various medical devices and medical technology. Bottom-up approach is always used to obtain insightful data for the specific country/regions. The country specific data is again analysed to derive data at a global level. This methodology ensures high quality and accuracy of information. Secondary research is used at the initial phase to identify the feasibility of the target products/technology categories and its respective segments, product offerings, usage pattern as per disease indications, product installed base in target healthcare facilities, life span of a device, reimbursement scenario, adoption rate and future impact of new technologies. Each piece of information is eventually analysed during the entire research project which builds a strong base for the primary research information. Primary research participants include demand-side users such as key opinion leaders, physicians, surgeons, and supply-side providers of medical devices who provide valuable insights on trends, key treatment patterns, adoption rate, and purchasing pattern, technological development of medical devices, patient education, effectiveness of manufacturers and important strategies, pricing and competitive dynamics. 16.2.3. West Pharmaceutical Services, Inc.